If you are in love with creative solutions, you will definitely appreciate new ways to make red highlights on black hair. Women with black hair are always looking for new ways to diversify their image. Red highlights are a very brave option. Depending on the hue, your black tresses can either turn into something soft and bright or become a great way to make a statement with your style. So if you are contemplating a style change, these options will give you the inspiration to make the next step. Knowing what other women did with their hair can help you make the right decision today. When you first think about red highlights on black hair, the idea might seem a little scary. However, the further you go, the more you’ll understand how fabulous such style can make you look. You can start slowly by creating partial highlights to see if the color really suits you. But be sure, at least one of the many red hues will be exactly what you are looking for. The black and red mix is a no-lose choice so don’t be afraid to make color experiments. Some women prefer dyeing just one strand first as a test. We recommend going for a full highlighting job to completely change your image. When it comes to choosing the hues to do the highlighting, many women prefer burgundy red. However, if you are looking for something more impressive, you can mix burgundy top with flaming red locks on the bottom. Highlighted ombre is exactly what a girl who needs a style change should be looking for. Leave the bottom part of your hair black and add flaming highlights to the top. Save dye and money. Raven black hair looks impressive on its own. But if you want to add a little oomph, consider red highlights. You’ll be amazed at how explosive your tresses will look and will never go back to just black. Partial red highlights on black hair are exactly what you are looking for when you are not sure how red will suit you. Add a few strands in front to test the color and get an idea if this iswhat you really want. The best way to understand if you need red highlights is to get a weave. Add some red hair extensions on the bottom and your image will drastically change for the better. Light red tresses are exactly what you need to make your image brighter. No matter what base hair color you start with, red will change you immediately. Forget about simple black and auburn locks, go red! Hidden highlights are becoming more and more popular. It’s a great way to add some mystery to your image. Your hair will look black until you make a subtle move and brush it backward to reveal red tresses. If you want to cover your black locks, consider creating burgundy highlights all around your head. This way you’ll get a hairstyle close to an ombre without coloring too much of your hair. Get a low ombre by dyeing just the bottom part of your tresses red. Don’t be afraid to color the tips. If you don’t like the way they look, you can just get a haircut without changing your image too much. Full blown red highlights on black hair look truly amazing. 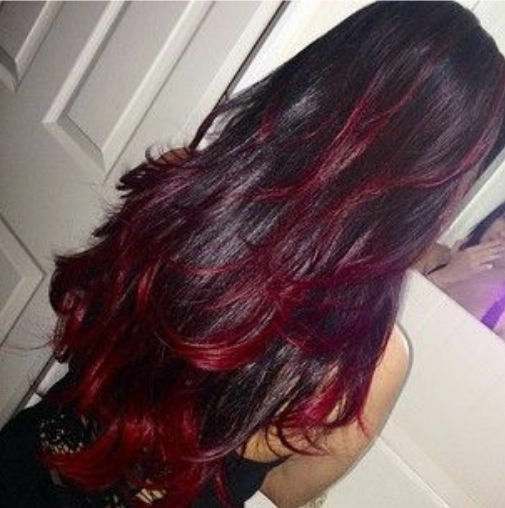 If you are ready for the stunning black and red look, don’t hide behind Ombres and partially dyed strands. Go all out! Burgundy ends look great when coupled with raven black strands. You can create a flaming image with the least effort. You can try temporary dye to make sure it suits you. Red highlights on black hair will look even more inviting if you decide to make a soft transition from dark red to black and then add a few bright red strands. The red and black combination is always a winner. Copper violet strands will brighten up your image even if you use just a couple. It’s the fastest and easiest way to make your image appealing, mysterious, and impressive. If red seems like too much for your tastes, you can get as close as possible to the shade by using brownish hues. Auburn is a perfect first step on your way to red and extravagant tresses. If you have short or medium-length hair, red highlights will look especially appealing when you use them on the very ends of your locks. The should look as if they are peeking from underneath. If your hair is naturally black, you can start with red highlights to get to a full-blown red color. Redheads are rare and that makes this hair color very popular. You’ll definitely get some heads turning your way! Red copper blonde is a wonderful hair color to use with black tresses. Make a few highlights so they are arranged subtly all over your head. You will love the result! If you are ready to make a brave statement, then this hair color is for you. Use flaming violet brown shade to create a wonderful contrast with your natural or dyed black locks. Before making a decision to create red highlights on black hair, you can try the way they look without any dyeing. Opt for burgundy hair extensions and attach them underneath your hair to see how the color looks with your own locks. If you want to softly change your hair color from black to red, highlights can help you do just that. Start with a half of your strands and then go further until all the head is covered. If you are not after the classics and really want to make a statement, then you can check out this photo. Create subtle red strands in-between your black locks and dye your bangs light brown. The mix is amazing! Violet chestnut is a wonderful shade of red that looks especially amazing on black hair. Don’t make the highlights along the whole length of your hair. Make a few in the middle to start. Dark red highlights on black hair look impressive even if your locks are short. They seem especially alluring when you have a short a-line bob, so give it a try! If you are not afraid of experiments, consider trying wild shades of red. They usually make the best impression and make you look tremendously fabulous. Sew-ins are a great way to create highlights without damaging your hair with dyes. They are also perfect for girls who like changing their hairstyle often. Try a few violet ones and enjoy the result. It’s hard to go wrong about creating red highlights on black hair. All you need to do is use your imagination without being afraid of a new and wild image. Choose the best option from above or come up with your own and go for it today!